Are you a hip young Obama supporter? Interested in helping to raise $1.6 trillion for his administration’s latest miscellaneous military action? This Second City parody might be just for you, says Miranda Green. What the world needs now is a strong dose of satire. 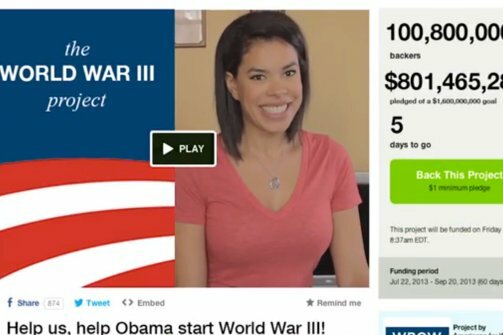 Faced with a near-broke nation and the moral imperative to punish Bashar al-Assad’s regime in Syria for using chemical weapons, an intrepid group of young Obama supporters has launched a Kickstarter campaign to help pay for World War III—or whatever the president wants. The online crowdfunding petition—helpfully named “Help Kickstart World War III!”—is part of a parody YouTube video from the Second City comedy troupe asking donors to help raise $1.6 trillion to support the Obama administration’s latest miscellaneous military action. Since the video was uploaded to YouTube on Monday, it has racked up more than 800,000 views. Conservative publications such as Glenn Beck’s The Blaze first championed the video for its depiction of Obama voters as mindless followers, but Loos said liberal publications later followed suit, helping it to attract thousands of views. So what are the benefits of donating to this fake Kickstarter campaign? According to the video: getting a shout-out from the group on Twitter, a piece of rubble from a war-torn country kissed by Sen. Lindsey Graham (R-SC), or a day pass to leave your local refugee camp—since after the war it’s likely you’ll end up in one.